When it comes to developing the annual Big Book statistics about the nail industry, I find myself fascinated as much by the contradictions as the patterns. 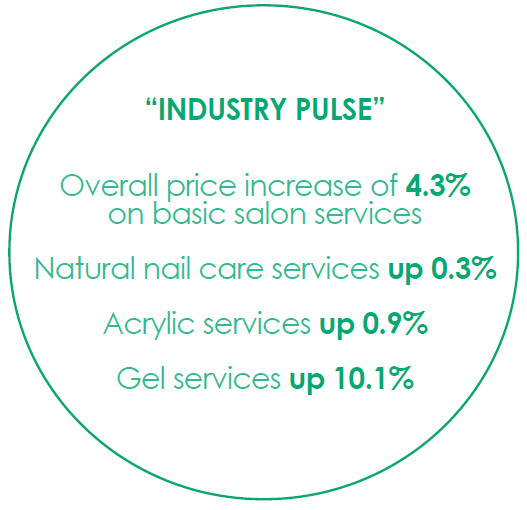 I wonder: If 15% of nail technicians say they increased the prices on their basic pedicures and only 1% decreased prices, why are prices for pedicures essentially flat? Shouldn’t the average service price have shown some lift? If 72% of nail techs say that they like purchasing their products online, why haven’t we seen a bigger increase in the number of online dealers and why do beauty supply stores remain so enduringly popular among nail techs? And if it’s true that it’s hard to get men — who have traditionally looked at nail salons as the domain of women — why are the majority of your male clients over 45? It seems like that particular demographic would be the most difficult to persuade to come into a nail salon. More than three-quarters of nail techs say they sell retail products for clients’ at-home use, but why is it that I rarely see retail displays in nail salons across the country? These are questions our editors are considering now in planning new material for the coming year. We have our own patterns and contradictions here at NAILS too. We love the Big Book, with its fun- and fact-filled pages; yet, we loathe it, as it makes the month of October a month filled with late nights, missed trick-or-treating, and lunch at our desks. We know how useful the Big Book is for the industry and yet we go bleary-eyed fact-checking our Excel sheets in fear of transposing a telephone number or misplacing a decimal in a service price. So, a few words on how we develop this data. And, finally, it is without any contradiction at all that I express appreciation to the team at OPI Products, as always, for making this expansive statistics section possible. Suzi Weiss-Fischmann and George Schaeffer are two creative individuals who put a lot of faith in hard data and use this information themselves. Their sponsorship of this section makes it possible for us to provide this valuable tool and we appreciate it greatly. NAILS’ market size projection figures are estimates derived from our own research. They are calculated (in a proprietary way) based on the number of salons in the U.S., the number of nail technicians per salon in each state, the average service prices of four key salon services, and an estimate of the number of practicing nail technicians. The final figure represents, to the best of our ability, the total amount of money spent in the U.S. in nail salons for services. thanks this post, you can write a post bout nail industry statistics 2015, i think helpful for anyone , have a nice day !